‘They never fail me’, she says. ‘The Angels of Light are there only to protect and to guide; to help and make one prosper. Whatever you seek –an end to your money worries, improved health, luck in love –whatever –they are there to make it happen. ‘I have lacked for nothing, and I know that I shall not want for anything –I am convinced of it!’, declares the author. It is so simple. All you need is a ordinary tea-light candle, costing only a pittance, which you can get from any supermarket. It is through the light of the ﬂame that the contact is made. The angels are irresistibly drawn to anything alight. 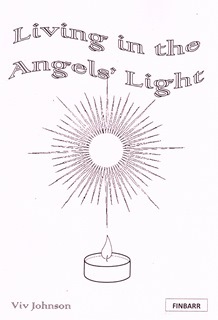 This booklet gives you the names of the Angels of Light and the exact prayers to say. They are ready, willing and eager to help. Immediately. THE CONTENTS OF THIS PUBLICATION ARE AS EASY AS ABC. But –in an instant –you can be in touch with the Powers of Light. ‘The universe is not such a cruel place that you were put on this earth to struggle along, unaided, which is exactly how most people go through life! ‘It is because they don’t know. They have no idea that the spiritual help is there –just for the asking!’ Asking the Angels of Light on a regular basis brings you closer to them, and they to you. You will be surrounded and enveloped by a loving presence. You daren’t tell anyone, for they will think you are mad, but you will know it’s for real because you will be experiencing it. You will feel genuinely reassured and comforted, as you see your problems fading away, one by one. You will be ‘Living in the Light’. The Angels of Light are pure love, irresistible forces for good, agencies of peace and harmony, dissolving all discord and negativity in their path. ‘Living in the Light’ brings protection from harm and injury! It protects against disappointment and heartbreak! It brings love, prosperity, and whatever else one may seek! You don’t have to worry about ‘receiving an answer or not’. The Angels of Light do not fail to respond! In this publication you will ﬁnd the exact Angel Prayers for: Fertility … Creativity … Career … Prosperity … Love –but in point of fact you can ask for anything you want. There is no limitation to their power to help. With these Guiding Lights in your life you are going to feel inspired, energized, and rejuvenated. You will feel you cannot fail, no matter what.